This NiB-X® coated 7075 T6 Billet Aluminum upper drops onto any Mil Spec lower receiver for ultimate reliability. Looking for a stellar Made in the USA complete upper? WMD has the perfect billet AR-15 package for you. 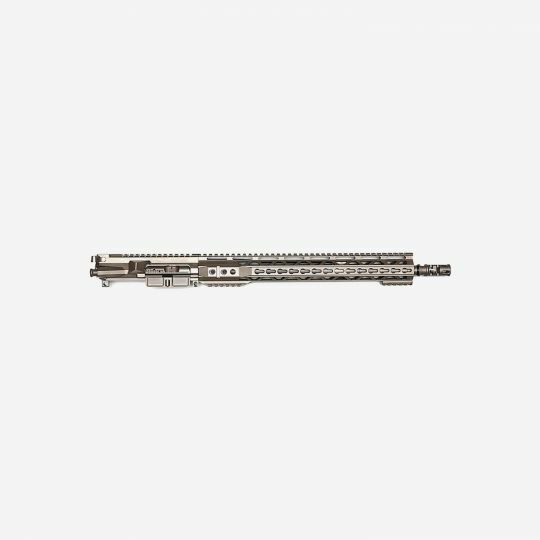 Includes NiB-X coated 7075 T6 Billet Aluminum upper and charging handle, NiB-X BCG, Match Grade 1:7 twist, 16” barrel with Nitromet bore and Nib-X finish, Nitromet gas tube, NiB-X low profile gas block, 15” NiB-X Keymod aluminum handguard w/1913 Picatinny rails and hardware for mounting, a NiB-X recoil and muzzle rise reducing compensator. Drops onto any Mil Spec lower receiver for ultimate reliability.